Sailing from Tighnabruaich a little after midday, HEBRIDEAN PRINCESS headed up the West Kyle to the Narrows, as the tight channel between the Burnt Islands is known, and entered the East Kyle. 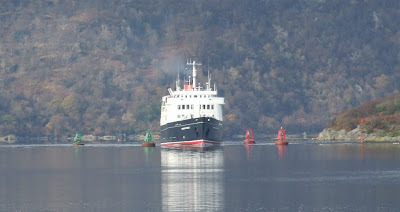 In the first view, HEBRIDEAN PRINCESS is seen passing between the buoys which mark a safe route through the Narrows. In the second view, HEBRIDEAN PRINCESS is passing the small village of Colintraive, where the Caledonian MacBrayne ferry LOCH ALAINN is lying awaiting another crossing across to Rhubodach on the island of Bute. 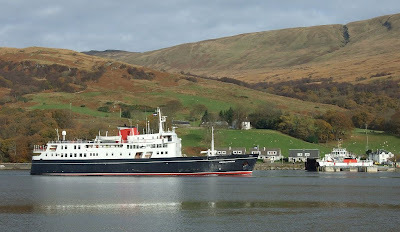 There is a somewhat tenuous link between these two ships - HEBRIDEAN PRINCESS was built in 1964 as the David MacBrayne car ferry COLUMBA, and placed in service between Oban, Craignure on Mull, and Lochaline on the Morven peninsula. With the passage of time, Lochaline was linked to Mull (and indirectly to Oban) by a new, shorter, crossing, to Fishnish. It was to serve on that route that LOCH ALAINN was built in 1997, although as described here previously, she commenced her career on the Rhubodach service. I some more nice ones John. lovely looking ship,which I keep missing! Brilliant shots, a pleasure to view.